Slow down, Live well. A tag line for Elder Airlines? 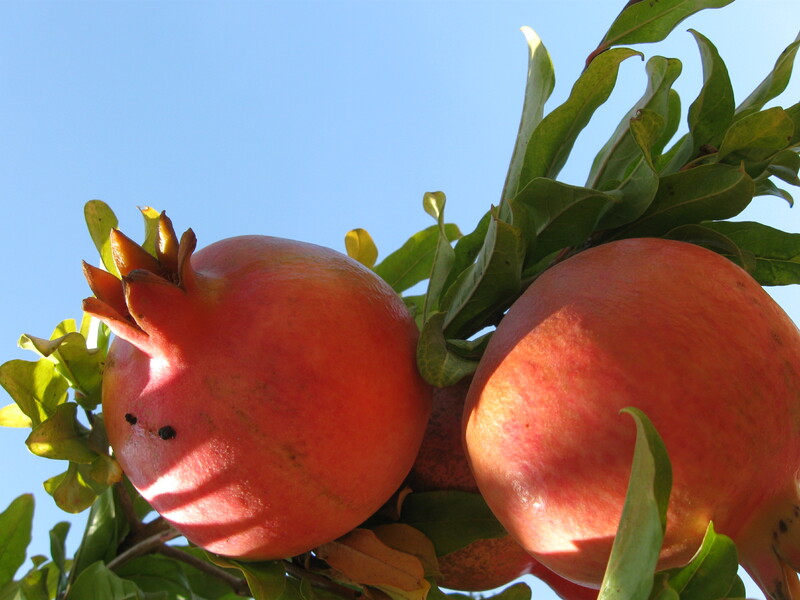 Actually it’s the wisdom I gained over the hot dry summer while my pomegranates ripened. I remember my father saying, “I’m slowing down.” Then it meant he could only play nine holes and not the full eighteen. I never imagined such a process would happen to me, of course, because one, I didn’t play golf and two, young people didn’t age. Only old people aged. My slow down caught me by surprise in the techno-gym. I thought I could exercise there with the same agility as I did in a similar, though more friendly gym, ten years ago. Now my body said, “Sorry. No walking on the treadmill. No stationary bike.” The orthopedic man I consulted on all fours put it more bluntly when I asked if this meant I was getting old: “Yes,” he said, without a smile. I would have kicked him in his own old face, but my right hip hurt like Hell and I had to get over to the x-ray office down the block. Apparently my hip is not unlike those of all people in the Western world over the age of nineteen. It’s showing signs of deterioration. In other words, it’s decomposing, doing its slow death dance. I had a choice: I could blame the twenty-something trainer at the techno gym who, when he told me how to exercise, totally ignored the fact that my body has been around since the end of World War II. I could blame God, OR, most uncharacteristically, I could accept the facts of life. All live beings and fruits flourish, deteriorate and die. This fact, rather than hitting me in the head, hit me in the hip. Though I love to write, I do not love to sit, which is why I signed up for the techno gym in the first place. With the orthopedic expert telling me not to do anything at the gym except ask for a refund, I wondered what exercise I could do with a bum hip. “Swimming,” said the doctor, disturbed that I was hanging around asking questions. Swimming is a hassle. First you have to pack a large bag with cap, suit, clogs and goggles, towels, creams, shampoo and not forget the conditioner. Then you have to drive to the pool, find an empty locker, put on the bathing suit, etc etc. Afterwards you have to shower, dry the long hair, get dressed, put everything wet into the large bag, not forget the conditioner and drive home. But if it’s swimming or aging early, I’ll swim. The first three weeks I swam twice a week. I didn’t want to overdo it, as I had at the gym, so I limited myself to twenty minutes each visit. I didn’t rest between the laps. I pushed myself to perform, though nobody was watching. Last week I swam only once. But last week’s swim made me feel like swimming and I may become friends. This swim was preceded by twenty-four hours of sleep over two nights, after which I woke up early with enough energy to pack and drive. For a change, I took my swimming slow. I ignored the large clock on the wall which only a week earlier had stared at me and mocked my pace. I felt relaxed, enjoyed each stretch of my arms, each kick of my legs. Nothing hurt, not even a hip. Why hadn’t I discovered this swimming business earlier, I berated myself and then, most miraculously, told myself to be more forgiving. Let’s be thankful I discovered this blissful state now, this gliding through water in a silent pool, the water warm; this floating outside time in liquid space, time rippling with memories of childhood swims. I swam slow for thirty minutes. The living well half of this equation seems to be dependent on the slowing down. If I listen to my body and accept its messages rather than ignore them or fight them or fear them, then indeed, I can live well. Was that me floating from the pool into the changing room, a beatific smile across my wet face, when those words surfaced to consciousness? Slowing down; living well. This entry was posted in Identity, Walking and tagged bum hip, slowing down, swimming. Bookmark the permalink. Another wonderful post! I love these. Keep ’em coming! But wait, no: go swimming first! By the way, have you considered writing standing up? I saw an interview with Philip Roth where he stands and writes (types) at what can only be called a shtender. Anyway, your piece is a gem. Though you probably aren’t planning to show it to your orthopedic man. Actually, I had a local carpenter build me a stand, but I don’t use it so much because I didn’t take into consideration the angle of and space for the mouse. Suddenly, I felt a pain in my wrist. Couldn’t deal with hip and wrist in same month. Thanks for your enthusiasm, Joan. I’m impressed, Ruth, that you go swimming 3 x/ wk. The pool I joined also offers a host of classes, but I have less patience for classes now. This, too, may be a result of slowoing down. Sorry I couldn’t make the Ethiopian evening. I bet it was delicious. HI Judy, I won’t say I told you so, because your body (and, you must admit, the orthopedist) told you so! Enjoy your swims. You were 100% right, Rena. From now on, maybe I’ll consult you before going to a doctor. Judy, you found a wonderful solution to your problem. The principle makes a lot of sense, though the practice (swimming) is not for everyone — and certainly not for me. I walk, but just before I left home for two months at the beginning of this month I was finally using a stepper I’ve had around the house for years — working up slowly to about 8 minutes at a time. I’ve learned that it’s important for health (and sanity) to get up from your desk every hour and move around, even for just five minutes. For me, the stepper has become the perfect solution. But every body is different and you’re right about listening to your body. 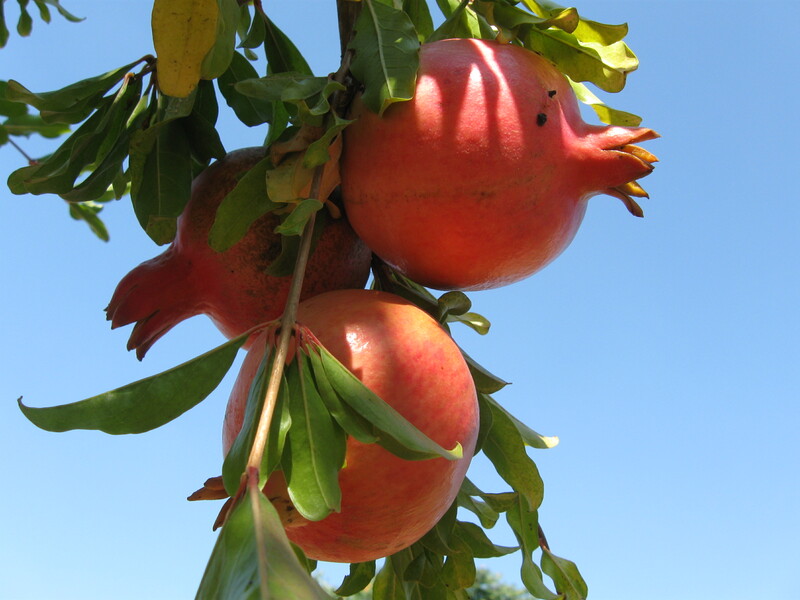 beautiful pomegranates! That your tree? I’m the world’s slowest swimmer. But I love it. I don’t count laps. Just swim, and feel the lovely pull of muscles. I used to write standing up all the time when Amalia was a baby. Strapped her on my back and go. It’s really worth while finding an angle that will work for you. AFter that, it’s really nice. You can even pace when you write. So glad you like the pomegranates, Marcela. I have five this year on a tree that used to grow in a pot which I replanted when I moved to Beit Zayit. This is its largest yield. Shana Tova!